The first time I walk into Banh Mi Ba Le on Dundas Street just west of Spadina Avenue, there's a strange sound similar to skates swooshing through ice on a rink. I realize it's coming from the two servers stooped behind the counter. The noise? Vigorous carrot and daikon radish grating that later gets lightly pickled. 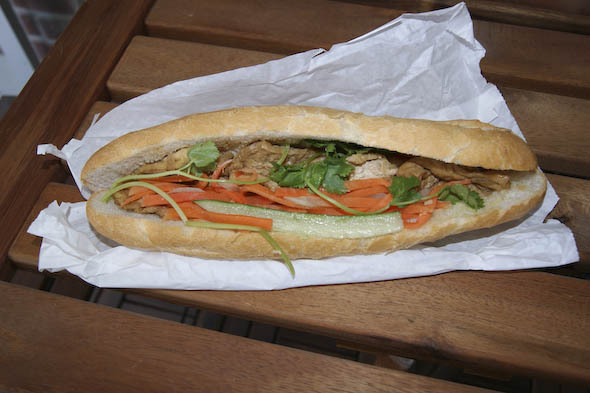 These become fresh toppings on the banh mi, a Vietnamese sub sandwich consisting of a variety of meat or vegetarian fillings on a French-style baguette dressed with butter, mayonnaise, cilantro, a soy-based sauce and optional hot sauce. The doors at Ba Le seem to be revolving. 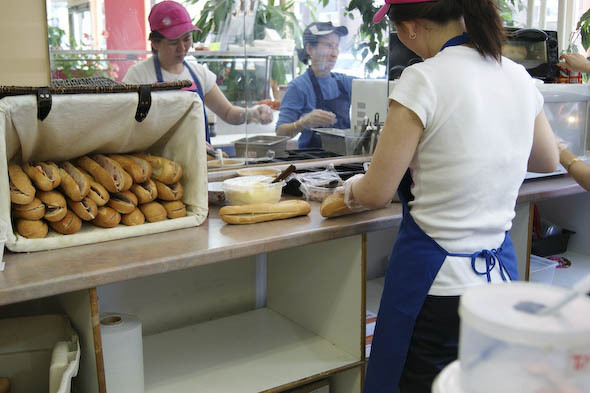 One customer after the next pops in, orders their choice of banh mi, places a quarter and a toonie on the counter and just as quickly walks out with sub in hand. 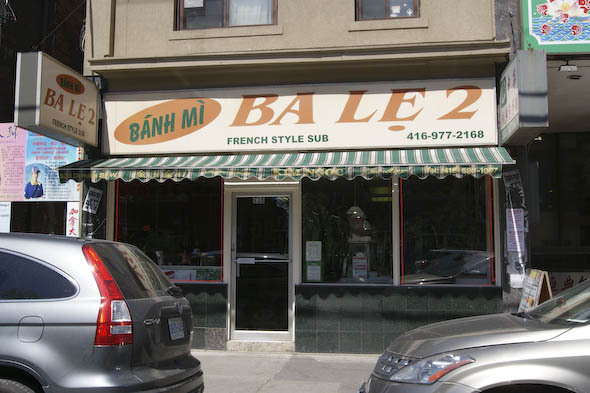 For $2.25 for any choice of filling listed on the banh mi menu board, Ba Le is a great deal for a satisfying sandwich lunch. The shredded chicken (top photo) is light, savoury and well-moistened by the dressing and optional hot sauce. The cilantro and cucumber slices along with pickled toppings add a bright hit to the sub. The tofu version, shown above, is a favourite using large fried tofu squares with or without tomato. 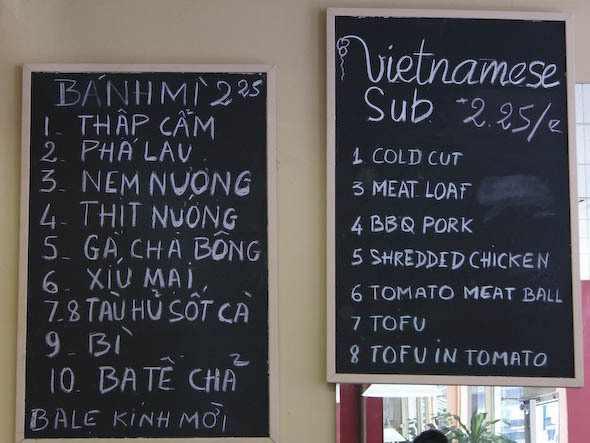 The Vietnamese menu has three additional items that don't appear on the English menu. Pha Lau (#2) translates to intestines and even the servers don't want to recommend it, steering customers to the ever popular Cold Cut option which includes a mix of deli meats and a better deal they say. Bi (#9) is shredded pork and Bate Cha (#10) is a type of pork liver patĂŠ, both of them non-offensive which leaves me wondering why it's not on the English menu since the patĂŠ already makes it into the Cold Cut option. To me, the real find at Ba Le is the hot menu. The hot menu isn't prominent, located off by the side counter, and very easy to miss. It's worth the time it takes to enjoy a bowl of noodles if you don't mind eating at the makeshift dining/waiting area. The hot menu items are also available for take-out if time is short but these are dishes best eaten on the spot while piping hot. 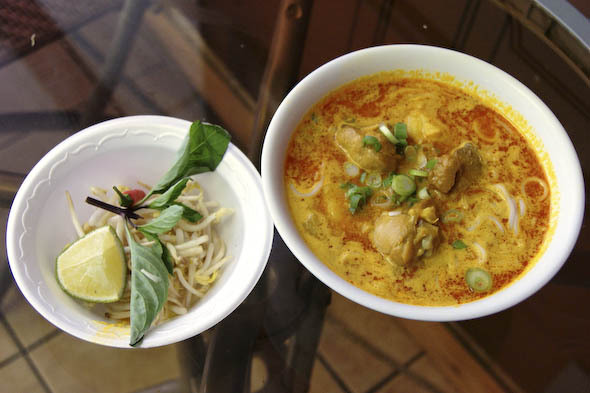 Items range from the economically-priced Chicken with Lemon Grass or Ginger Noodle Soup ($3.00) to the creamy Curry Vermicelli Soup ($5.00), shown above, which includes four bone-in chunks of tender skin-on chicken and medium spaghetti-sized rice noodles bathing in curry soup. Sprouts, basil and a bird's eye chilli are offered on the side which is stirred into the creamy soup. 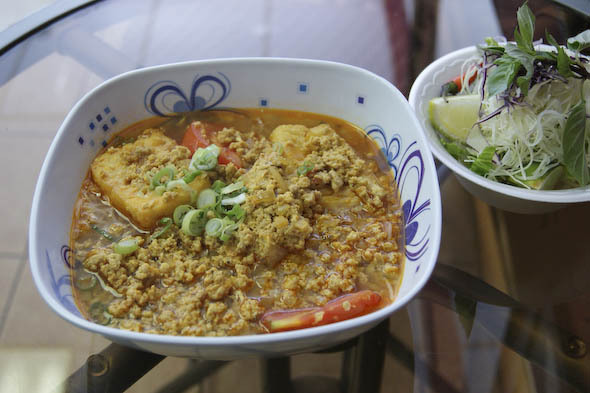 The Bun Rieu ($5.00) uses the fine rice vermicelli that's closer to angel hair pasta in size. This is a highly fragrant soup of crab meat and egg with large pieces of fried tofu. The crab and egg make a curd-like topping and has a heady, fish market smell to it. The lime wedges and shredded cabbage, basil and lettuces get added in to the soup and tone down that initial fishy waft and when combined turns this into a luscious soup. 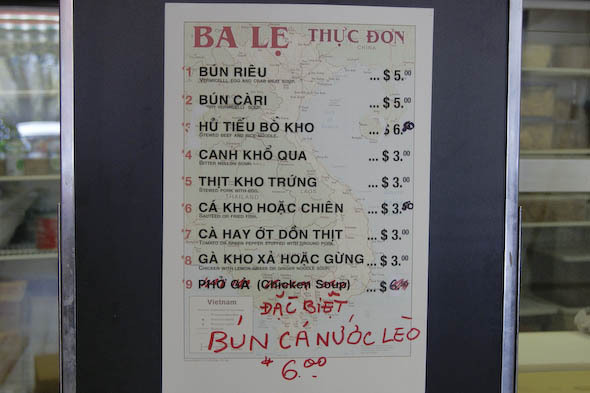 Finally there is one hand-written Special added to the hot menu which is the Bun Ca Nuoc Leo, a type of vermicelli fish soup ($6.00). 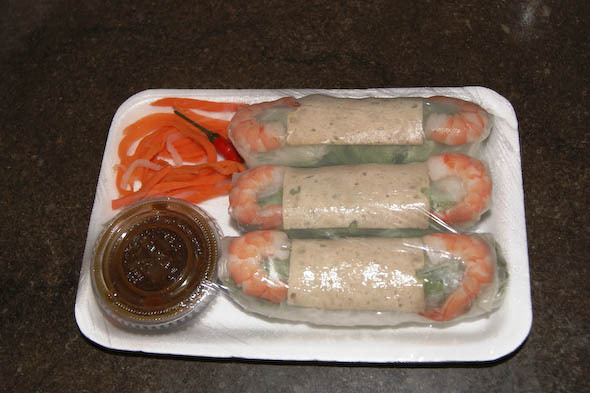 An assortment of prepared take-away items are also available at the counter such as these Rice Paper Salad Rolls with Shrimp and a slice of deli meat. For $3.25, these rolls are fine, but compared to the well-priced subs or hot noodle dishes, there are better choices. Eating at Ba Le is a win-win scenario for your taste buds and your pocket book.